POUR DE MEILLEURS RÉSULTATS: Contacter le propriétaire par e-mail ou téléphone: 608-548-2564. Questions, réponses et les meilleurs à vos doigts conseils. Découvrez ce magnifique chalet en bois rond situé dans un cadre de bluff rurale avec de belles vues de la faune. Profitez de la paix et de calme après une longue journée de plaisir dans la région environnante. Cette cabine a tout ce dont vous avez besoin pour une escapade détente. Son une grande retraite et très bien situé, à quelques minutes de Wisconsin Dells & Castle Rock Lake. Bien que la cabine a toutes les commodités modernes, la maison maintient toujours un aspect lodge rustique, et nous souhaitons partager avec vous !! De nombreuses attractions et restaurants sont à distance de conduite facile. Vous pourrez vous détendre sur le porche couvert dans le bain à remous donnant sur la belle vue, ou tout simplement s'asseoir sur le pont et profiter de la paix et le calme de la campagne. POUR PLUS DE PHOTOS! .........Voir 'CABIN-n-BOIS «Web PAGE LIEN CI-DESSOUS. Great cabin on a beautifull piece of land. The cabin was very meticulously kept, and well stocked with pretty much everything we needed. My husband and I stayed at the Cabin In The Woods for a weekend without the kids to relax. We had an amazing time and Bob was an amazing host! The cabin is absolutely stunning and very clean and tidy. The location was perfect - away from the hustle and bustle of the town, on a back country road with an amazing view. Only 30 minutes from Wisconsin Dells and the city of Mauston is a descent sized town with many stores/restaurants available. We enjoying sitting in the hot tub on the porch and just relaxing. It was an amazing weekend and we hope to be back!! Well....What can I say to that wonderful review??? It was so nice to meet the two of you during your short but sweet winter getaway. 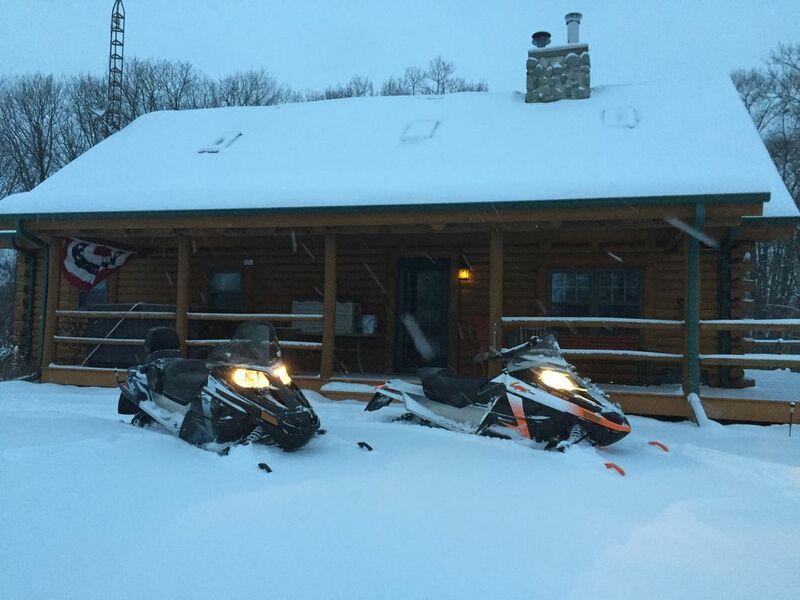 It was the prefect Wisconsin Winter storm with the rain, ice and fresh snow that reallly makes that cabin cozy.... and we are glad you enjoy every minute!! Thanks again and hope we can accommodate you two in the near future. We enjoyed this property. The hot tub was the perfect was to unwind after a day of skiing at Cascade. Beautiful, clean cabin with well stocked supplies in kitchen. Owner available to assist if needed, but did not interrupt family events. We spent the weekend here for our annual ladies get away. We had 7 in our party and the cabin was the perfect size for all of us. The hot tub was wonderful; we took a nice hike Saturday morning on the trails behind the cabin. The fall colors were beautiful! Great place, hope to be back again next year. Perfect guys weekend get away! We were glad the weather was good for your group so you could take full advantage of what the cabin and property have to offer. NOTE!! VRBO /Home Away Site will give you a nightly rate that is an average of our summer and winter rates. This average is also based on a party of two adults. With that said.... rates are subject to very on time of year and # of guests in a group. Standard rate (Summer) of $235.00 per night applies to two adult guests. Winter rate is $325.00... Fee of $30.00 per person per night there after. Only registered guests are allowed in or on the property unless prior approval by the owners. If additional guests are added an additional fee of $25.00 per person per night applies.